Honestly, the damage wasn't that bad. 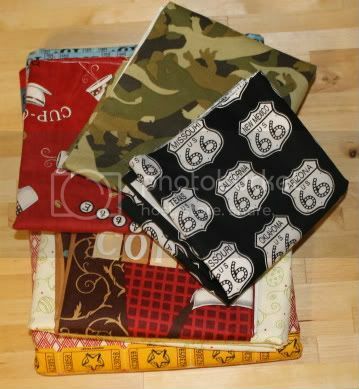 This is my purchased pile - Route 66 for the Dude's Cars quilt, camo dinosaurs because they were REALLY soft, a bit of coffee fabric and a panel for the kitchen stuff I'm never going to make, a yard of Merry & Bright to go with my Kaleidoscope quilt, backing for my Layer Cake Quilt Along, borders for the Steeler's quilt (woo! ), a half yard of a random red floral, and two Sunkissed charm packs. And the freebies! 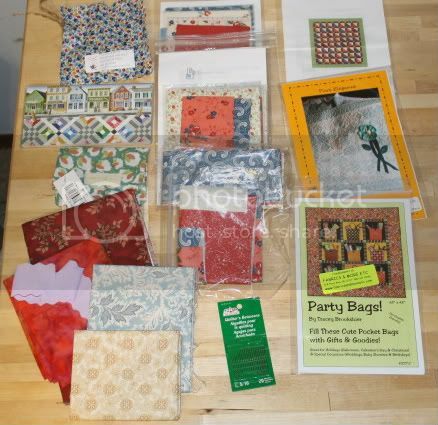 A bag full of buttons, a wallet, a couple fat quarters, quilting needles (needed those, yay!) and some patterns. The bags in the middle are the Shop Hop blocks in Charlevoix - each of the eight shops designed a block. The Dude had to come with me because his dad is flying this weekend. He did...mostly okay. At the seventh shop, he talked to my mother on the cell phone and loudly declared to the entire shop that "Mom was going to TOO MANY quilt stores." Everyone cracked up. And I didn't finish anything - busy with VBS in the mornings, errands and cleaning in the afternoons, and balancing time with the Dude to sewing Railroad Crossing blocks. They're almost done - after weeding the garden I should get them finished today! Eek! I cracked 100 yards purchased!